While the forecast was not going to break any records for the Brisbane to Gladstone it did blow our plans for 1770 asunder. A nasty retribution looked like it would follow a glorious start to the Easter break. I certainly had no desire to slug it out against the tide and into a 25Kn SE from Middle Creek to 1770. Leave those conditions to the big (and not quite so big) boys returning from Gladstone under sail. 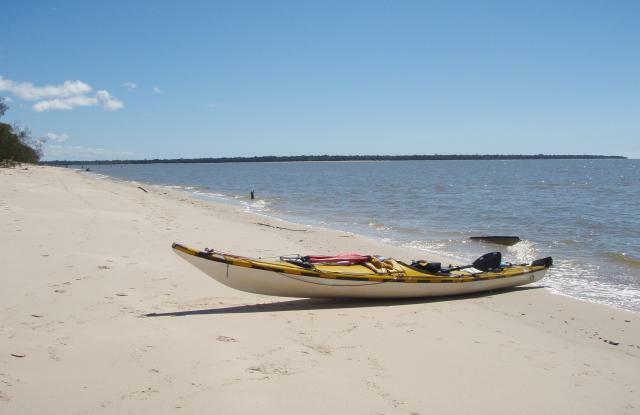 We chose to give the area a wide berth and make the most of the start of Easter at Woodgate where we had three very different day paddles, were treated to home comforts and a Bundaberg band which jammed an excellent rendition of Led Zepplin's Stairway to Heaven. On the road it seemed like every man and their boat had made a beeline for any place on the water north of the Sunshine Coast. 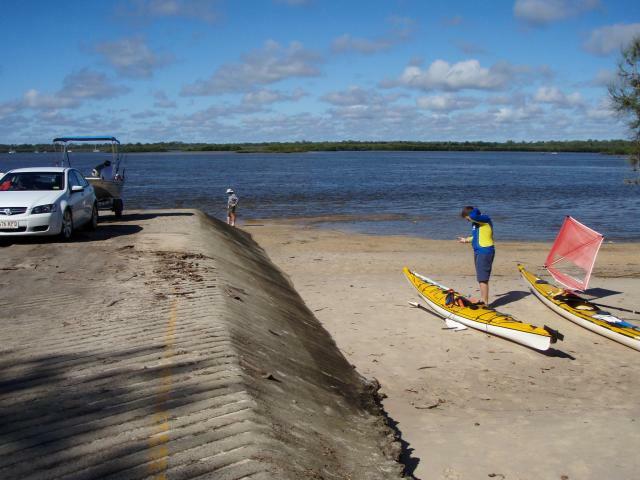 On Friday morning we arrived at Walkers Point boat ramp to find little room at the inn. 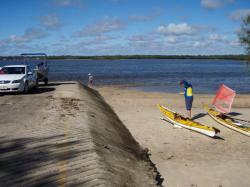 The place was cluttered with boat trailers of all sizes where they continued to launch two at a time. Two at a time guaranteed, as some smart cookie had a devised a simple yet effective remedy to thwart ramp hogs. The ramp was split in two by having one half descend at a steeper rate than the other. Clever way to keep the yobs on the straight and narrow - should be more of it. We set off against the tide to the mouth of the Burrum River in hope of seeing the herd of dugong we had been surrounded by on a paddle in the same area some years earlier. However the only herd we saw was that of people. They were everywhere. It was truly difficult to escape the crowds. 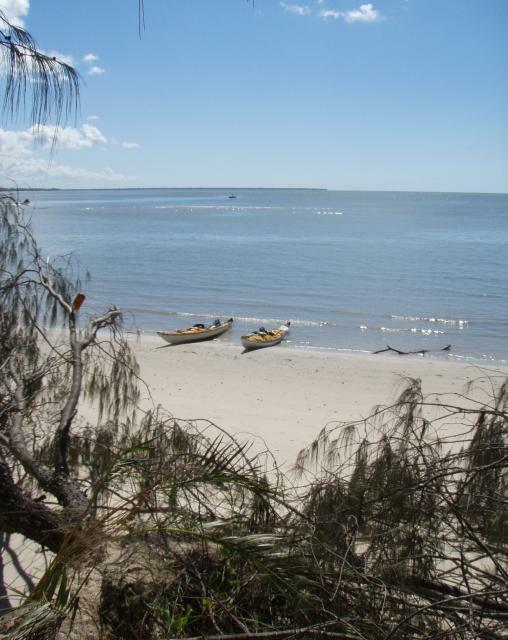 The coastline between Burrum Heads and Toogum which is not National Park has since kowtowed to residential estates and the multitudes are now here to escape each other. Unlike last time the water close inshore was murky. It looked like it was coloured by fine silt. I paddled past a rock and did a second take. Odd because this was a sandy beach. On the low it became a broad flat beach a couple of Km wide - the kind for sand yachting as there is little debris and no rocks. The rock morphed into coral, then the coral moved. The golden yellow coral had fine black spots and was the tip of the dorsal fin of the largest fish I have ever seen in the wild. 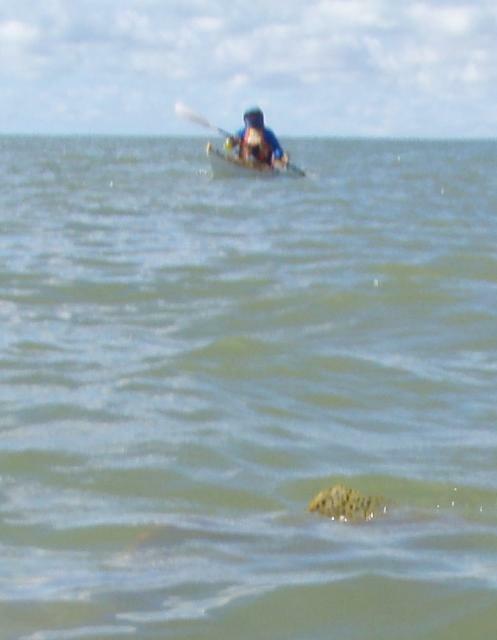 Even larger than the Maori wrasse at Luncheon Bay, this monster was just shy of the length of my paddle. I never got to see the head, it remained hidden in the murky water. It was unperturbed by my exciting squawking for Mark to get over here ASAP. When the nose of Mark's boat came close, I wondered if it was sick as it did not move, however Mark never got a decent look as the fish (later identified as a Queensland Groper) got wind of what was going on and shot off like a torpedo. I only hope this grand daddy stayed away from the offerings of the Easter fishing fleet. We shared home made biscuits for morning tea in the shade of a casuarina on a relatively deserted part of the beach before heading on to Toogum at the top of the tide. Be careful in this area - the beaches are massive and if you are caught short by the tide you are in for either a long walk or long wait. 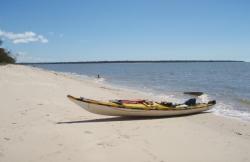 We pulled up below the eroded sandy banks south of the creek mouth. It was a leisurely lunch in the dappled shade where we could keep on eye on the boats, not from a tide perspective but because of the sheer numbers of people around. Kitted up we headed to the main boat ramp for a comfort stop. Along the way we pulled up next to a family with a young English Mastiff. Having had a Saint Bernard for 10 years, such a dog always catches our eye. However, he was not a happy puppy. Despite his owner's encouragement he remained nervous. We did not want to push the situation, a fear bite from a mastiff is not a good idea for anyone. I returned to the boat ramp to receive a rapturous welcome from a black labrador who had until then been playing with Mark. The owner assured me it was the high vis top that the dog was attracted as they wore them line marking. As soon as we kitted up with balaclava, hats and sun glasses this dog too suddenly changed, growled and would not approach either of us having just been playing moments before. So if you want to make a dog nervous just put on a balaclava and a pair of sunnies. Finally the wind had changed and rather than slugging into it we were treated to a NE which made for comfortable sailing on a rising chop. 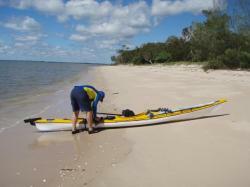 Mark saw a solitary small dolphin which remained illusive to my line of sight. No dugong this time around and the water was too murky to pick out the other dark shapes that frequent the mouth of the Burrum. 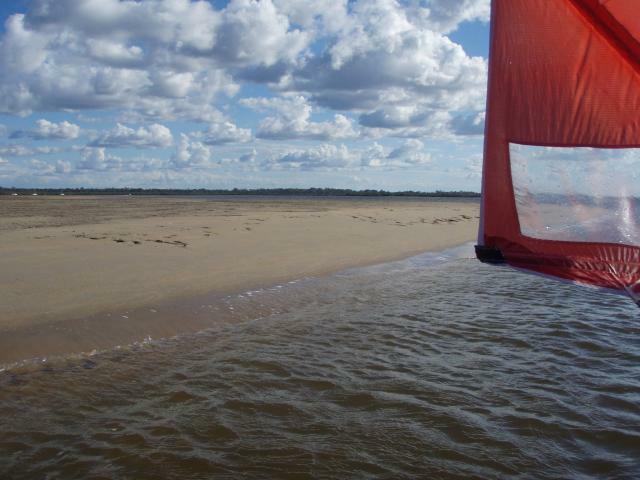 A missed judgement call had us knuckle over the sand bar for a couple of metres before entering the shallow tidal race with wind against tide. These are a lot of fun, it feels like you are ripping along as you surf the small waves, but all you are doing is 2Kmph as the tide surges out the mouth. As we neared the ramp a familiar "MARK" caught our attention - who can miss a mother's call ? It was Ann and John, they had come down for afternoon tea and watch us on the return leg up the river. It was duly noted that I was in the lead with a sail up while Mark trailed having to put the stick in as well as sail as we cruised in to the conclusion of a beautiful day out.